"This is sometimes another stumbling block, particularly to the Romantic notion of the practitioner whose aim is the expression of the self. We need to differentiate between activities that are to do with the personal development of the practitioner and his or her creativity, and activities that are significant for others in the field. It is only an activity that is significant for others that can be regarded as research. Personal development does not make a contribution to the 'advancement of knowledge, understanding and insight', except in the most parochial sense, i.e. my advancement. To illustrate this let us consider the discipline of arts therapies. It is the purpose of arts therapies to improve the well–being of the client through an intervention involving the client doing some kind of arts activity such as painting, music or drama, etc. Whether the client produces art, in the sense of 'a work of art' mentioned above, is irrelevant to the process. The activity is aimed at the personal development and self knowledge of the individual and not at the advancement of knowledge, understanding and insight into some issue shared by others. Of course, the client's case may contribute to the advancement of knowledge in arts therapies, but this would be an outcome for the therapist and not for the client. In addition, the client's productions may subsequently achieve the status of 'works' but this would be incidental to their original function in connection with improved well–being. Thus I would distinguish between (1) art as therapy (for the individual), (2) art as cultural practice (the production of works of art), and (3) art as research (meeting certain criteria under discussion). It is my claim that (1) and (3), that is, art as therapy and art as research, are mutually exclusive. I should emphasise that this does not mean that I deny that there is such a discipline as arts therapies research!" 29 January – 30 April 2011, The New Art Exchange, Hyson Green, Nottingham, UK. "New Art Exchange is delighted to present an exhibition of works by world renowned Magnum photographer Raghu Rai, for the first time in a public gallery in the UK, including new work from 2010. Rai's work proclaims the rich diversity of contemporary India, with its juxtapositions of ancient and modern, where the people are the landscape. He photographs an India teeming with colour, history, beauty and brilliance whilst uncovering a continent's domestic rituals with these striking images of Indian street life, festivals and the changing seasons. 'Over the centuries, so much has melded into India that it's not really one country, and it's not one culture. It is crowded with crosscurrents of many religions, beliefs, cultures and their practices that may appear incongruous. But India keeps alive the inner spirit of her own civilization with all its contradictions. Here, several centuries have learnt to live side by side at the same time. And a good photograph is a lasting witness to that, as photography is a history of our times: being a multi–lingual, multi– cultured and multi– religious society, the images must speak these complexities through a multi–layered experience.' 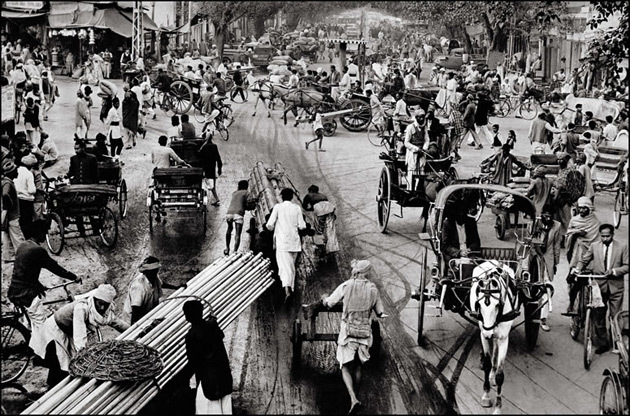 – Raghu Rai"
"dedicated to the people of Baro. Life has a rhythm, it's constantly moving. The word for rhythm (used by the Malinke tribes) is Foli. It is a word that encompasses so much more than drumming, dancing or sound. It's found in every part of daily life. In this film you not only hear and feel rhythm but you see it. It's an extraordinary blend of image and sound that feeds the senses and reminds us all –how essential it is. By the brothers Thomas Roebers en Floris Leeuwenberg. Film crew during one month in Baro, Guinee Afrika. Beutifull sound recording and sound design Bjorn Warning. Translator and Rhythm specialist Thomas Bonenkamp. With special thanks to the chief: DJEMBEFOLA |: Mansa Camio"
"Ads served by Reactrix (most often cast on the floor by overhead projectors) responded to consumers' gestures, allowing them to literally jump right into what they were selling. In one example, an advertisement for the Sci–Fi Channel's hit 'Battlestar Galactica' allowed those who stumbled upon it to learn about the show's plot and characters by touching spaceships flying by. Another let 'users' kick around a virtual soccer ball that reacted to their movements in real–time." "The post modern city is experienced as a sequence of several images overlapping and evolving through different scales of space and time (Watson and Gibson 1995). Through the cognitive images of different layers and elements of spatiality, it is possible to perceive the disorder of post modern cities. A fruitful avenue of exploration may well lie in attempting to reveal the unconscious mental mapping and cognitive imaging that people use to construct the city. In so doing this paper attempts to deconstruct or reveal the dense intersection of various cultural practices within public spaces, regarded as offering social meanings whether these coalesce or compete. Such public spaces are both a primary means by which social networks are enacted, and a metaphor for the spatial relationships within city fabric. Viewing the city through a deconstructive lens, it is possible to see the multiple manifestations of consumption of the post modern city fabric that enact a variety of (re)constructed identities (Fahmi and Howe 2000). The current paper introduces an urban experiment that proposes a (hypothological) city as an open framework of shared grounds/ownership. It includes built and unbuilt schemes as inserted within the fabric of the city, as influenced by history, human experience and contemporary culture. The article however examines the metaphors of space and being as manifest in the rhetoric of virtuality and materializes in real environments. It does so by looking firstly at precedents in the post modern built and media environment which have helped establish a discourse of immateriality upon which the rhetoric of virtuality depends; secondly, at the neo–futurist mechanisms which support the idea of an imaginative space in virtual environments; thirdly, at the appropriation of architectural metaphors that concretize and represent the spatial metaphor. The paper concludes by considering a number of conflicting forces that when initially encountered resisted the subversive rhythms of deconstructivism that challenge the normal stable institutionalized construction of space. In the information–knowledge culture, existing urban order is being replaced by highly complex new networks. Therefore there is a need to deconstruct the contested (post)modern city, with the current paper aiming to examine the fragmented multi–layered nature of public spaces in an attempt to emphasize the nature and institutionalization of post modern spaces. The examination of such fragmented urban patterns will try to unravel the contested nature of sequential images and overlapping layers of events as they emerge in people's daily interaction, with such social relations being mobilized through public spaces. Such spaces could nonetheless represent the (re) (de) construction of identities with new urban spaces signifying a focus for fragmentation and proliferation of social patterns which are contested and juxtaposed in post modern cities. Since the post modern city is based on the concept of disintegration of real space in virtuality, a development of new ways of looking at spatiality is needed, with emphasis being made on the changing notion of expression of identity. This latter is however developing in all directions at the same time as a result of new technology, new media environment, and new economy. The disappearance of nation states and emergence of regions will eventually lead to a restructuring of frame of reference (Fahmi, 2000a). In understanding the role of contemporary urban public life it is essential to identify certain aspects which reflect the diversity of the post modern society. Proshansky, Ittelson and Rivlin (1970) emphasized the significance of freedom of choice within public spaces where aspects of privacy, territoriality and avoidance of sense of crowding prevail. If people are involved in the location, design and management of local public spaces they are inclined to negotiate with rules of social interaction, with boundaries of public and private life being blurred (Altman 1975). Following Lefebvre (1991), we see that spaces are conceived as material in the form of design of space, as symbolized in the media and folklore history, and as imagined in the minds of planners, designers and politicians. Furthermore, Fadd and Jiron (1999) mentioned environmental qualities which involved the representation of various social, cultural and ethnic groups encompassed in the society, with each locating appropriate places. Therefore balancing people's spatial rights (Lynch 1981) or rights of action is a complex task, with public spaces being likely to have heterogeneous population performing different activities at different times. Urban public spaces can facilitate the creation of invisible networks of contacts which weave together the fabric of people–places relationships. On a cognitive level this assists in creating legible cities (Lynch 1960), with the ability to enhance images and memories of places, and to contribute to identities of people. These are components of place identity which can enrich urban life, and make the anonymous city comprehensible, familiar and manageable, whilst meeting users' needs."